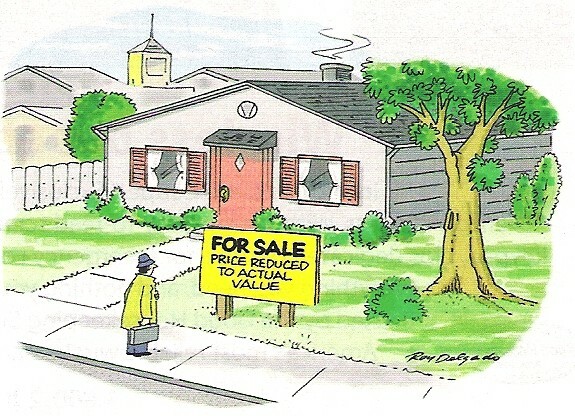 We put our house up for sale this week. Click here for some pictures. A House Divided. 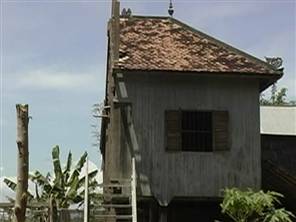 The divorce settlement for a Cambodian couple entailed sawing their house in two. “Very strange, but this is what my husband wanted,” said the wife. “He brought his relatives and used saws to cut the house in half,” she said, adding that she now owns the other half that is still standing. Walking House. This 10-foot high home is solar and wind powered and can stroll at walking pace across all terrains. 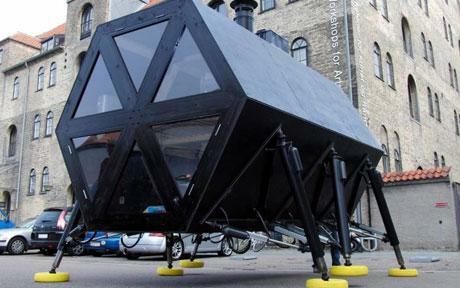 It has a living room, kitchen, toilet, bed, wood stove and mainframe computer which controls the legs. Designers say it provides a solution to the problem of rising water levels as the house can simply walk away from floods (or annoying neighbors). Downsizing. Bill and Sharon Kastrinos moved from their 1,800-square-foot home into this 154-square-foot home on their daughter’s property. The home has wheels and can be pulled behind their vehicle and plugged into any RV park in the nation. The downstairs has a sitting area, tiny kitchen and bathroom in a space that’s 98 square feet. The upstairs loft has a bed in 56 square feet of space. They keep extra clothes in their car. Here is an interesting graph from the New York Times showing the history of home values from 1890 to the present adjusted for inflation. The Yale economist Robert J. Shiller created an index of American housing prices going back to 1890. It is based on sale prices of standard existing houses, not new construction, to track the value of housing as an investment over time. It presents housing values in consistent terms over 116 years, factoring out the effects of inflation. Order the all New Kindle Fire here! We ran out of oil for our furnace last week, which I have since discovered is not a good thing. I knew we were getting low, but with oil at $3.85 a gallon, I was trying to nurse it along to the end of the heating season. Obviously we didn’t make it. When we first ran out, I thought we could get by without heat and fill up the tank later when prices are lower. But after a couple nights with the house temperature dropping into the fifties, I quickly changed my mind. I called some local oil companies to get a delivery of 20-25 gallons just to get us to the end of the season. No go. Every company had a 100-gallon minimum for delivery, and no one was budging. However, a couple of the companies told me that diesel is actually the same fuel as home heating oil. So I filled up two five gallon containers of diesel at the local gas station and poured them into the tank through the outside fill line. The furnace still wouldn’t start. First, make sure that your thermostat is turned on. Then, 1) turn off your furnace, 2) open the bleeder valve on the fuel pump, 3) turn the furnace back on, 4) allow air, oil and sludge to escape from the bleeder valve until you get a solid flow of oil (be sure to catch the escaping oil in some kind of container), 5) close the bleeder valve, 6) repeat the whole procedure if the furnace still does not start. I found a couple articles explaining this procedure in detail, but the best one by far was this one at WikiHow: How to Restart a Furnace After Running out of Oil. The other articles instructed me to hold a container under the valve when you opened it to catch the oil that would come spurting out. But this WikiHow article gave me the best tip of all — run a short section of 1/4″ nylon tubing from the bleeder valve to the container. I picked up a two-foot section of nylon tubing at the hardware store for 80 cents and went home to bleed the fuel line and prime the pump. The tubing worked perfectly and prevented a huge mess of oil everywhere. Don’t let your tank run dry. The bleeder valve is located on the side of the fuel pump, pointing down diagonally, usually at the 4 or 8 o’clock position. It most likely takes a 3/8 inch wrench. Run 1/4″ clear nylon tubing (1/4″ inside measurement; 3/8″ outside measurement) from the bleeder valve to the catch container to prevent a mess. Clear tubing will allow you to see when you get a good flow of oil going from the pump. You may have to repeat the procedure several times to get the prime going. I didn’t get any oil flowing until the sixth try. If your reset button is in lockout mode (mine was), you will have to press and hold it for about 40 seconds in order to reset it. You can take the oil you capture in the container and pour it back into your tank. 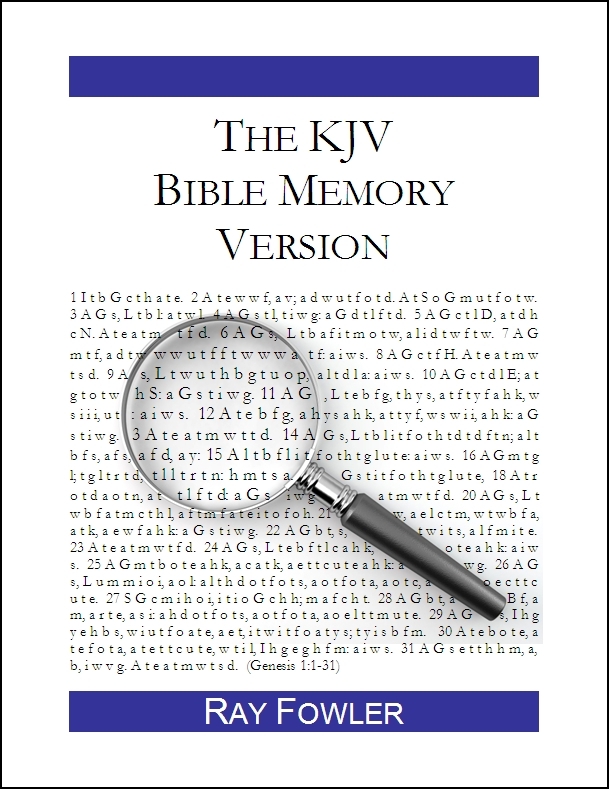 If you came to this article looking for information, I hope that helps. I am not very good at this stuff, so I am guessing if I could get my oil pump primed and running again, so can you! Click here for more Helpful Hints. Here is an interesting chart on the average American work day from the American Time Use Survey, released by the U.S. Department of Labor – Bureau of Labor Statistics. 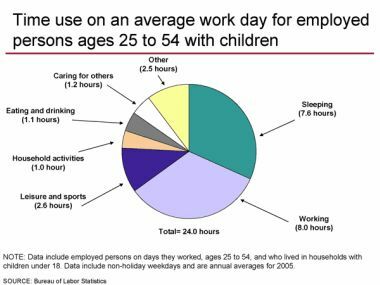 The chart shows time use on an average work day for employed persons ages 25-54 with children. Data include non-holiday weekdays and are annual averages for 2005. So, how does this compare to your typical work day?